Cudley the Cowlick is a trans-dimensional being that appeared in the Teenage Mutant Ninja Turtles Adventures comic series. Cudley was able to carry individuals in his mouth and carry them to foreign planets and realms. 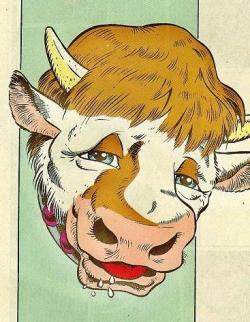 Cudley first appeared in the Mirage Universe in Tales of the TMNT volume 2, issue 52, and later returned in issue 58. This Cudley is, instead of a Mirage version of the Adventures character, exactly the same character as from the Adventures universe.